Your support for the Birdfont project is important. Even small sums makes a huge difference. You will get upgrades for as long as your subscription lasts plus one year. Send your questions to either johan.mattsson.m@gmail.com or @Birdfont on twitter. BirdFont is developed by Johan Mattsson. The editor is written in Vala and has around 82 000 lines of code. Discover fonts made with BirdFont and submit your own work. 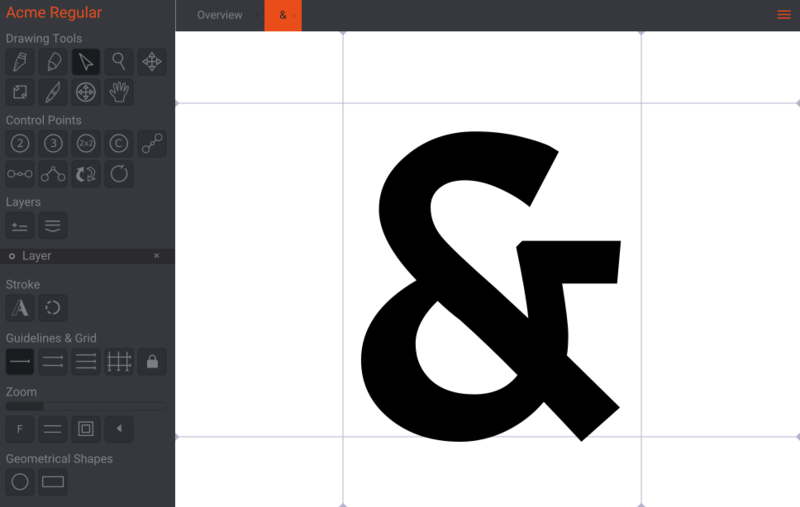 • Import and export large character sets in OTF fonts. • Fix OTF support (compatibility with After Effects). • Support for adding new Unicode points. • Show ligatures in search results. • Fixes for SVG files made with Illustrator. • OTF support, OpenType Fonts with PostScript outlines. • Make sure fonts pass validation in Font Book. • Larger number of kerning pairs is supported in the GPOS table (LookupType 9: Extension Positioning). • HiDPI support on Windows and bugfixes. • Move paths independent from handles or along handles. • Fixes a critical spacing bug and bugs in the drawing canvas. • Bug fixes and minor GUI improvements. • Autotrace – convert raster images to vector fonts. • Simplify paths. Deleteing points reduces the number of control points while still keeping the same approximate path. Use Ctrl+Del to break the paths. • Spacing classes that copies side bearings and kerning pairs from one glyph to another. This feature makes it easier to create fonts with only upper case characters as well as mono spaced fonts. • Copy and paste multiple glyphs in the overview tab. • A bug fix for quadratic control points in TTF files. • Parse transform directive in SVG import. • Crop rotaded and resized images. • Better conversion from SVG files to TTF fonts. • Load, save and export fonts in background threads. • This release solves kerning issues and other problems. • Import background images on new versions of Mac OS X and bug fixes. • Bug fixes and many changes to make BirdFont run on Mac OS X with a native window. • Two quadratic points with a hidden point in between creates a quadratic path with two line handles.